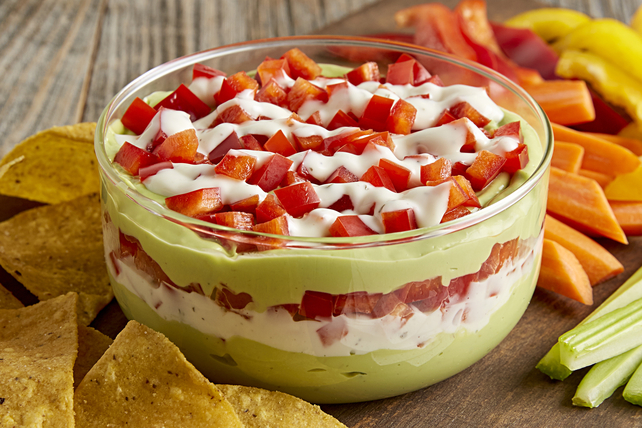 Entertain a crowd with our Layered Avocado Ranch Dip. In just 15 minutes you can dunk your favourite chips into this avocado ranch dip. Process avocados and 1/3 cup dressing in food processor until smooth; spoon into medium bowl. Add jalapeño peppers and garlic; mix well. Spread 1 cup avocado mixture onto bottom of 3-cup clear bowl; spread with 3 Tbsp. of the remaining dressing. Cover with layers of 1/3 cup red peppers and remaining avocado mixture; top with remaining red peppers. Drizzle with remaining dressing. Serve with tortilla chips and/or fresh vegetable dippers.